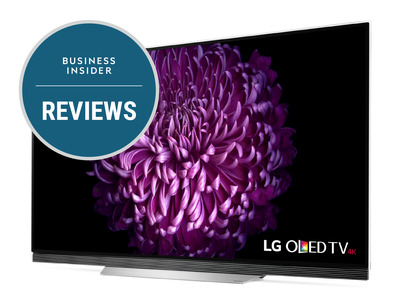 Business Insider/LGLG’s 65-inch E7 OLED TV. We’ve all walked past those gorgeous multi-thousand dollar TVs at our local electronics store that make our own sets at home look old and dated. The outrageous picture quality, all the acronyms like 4K, HDR, and OLED, the insanely thin borders around the screen. Have you ever wondered what it would be like to have one of those super-pricey TVs in your home? I asked LG for a review unit of its $5,500 65-inch E7 OLED TV so I could experience what it’s like to own one of those eye-watering sets, and the company obliged. 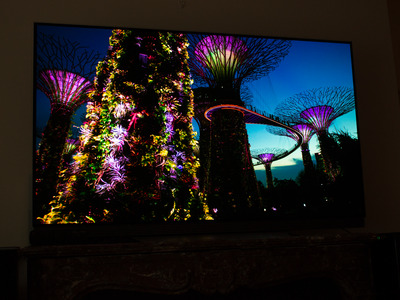 It didn’t take long to appreciate the E7’s giant 65-inch screen, its sharp 4K resolution, and the gorgeous, inky colours that only an OLED display can deliver. Poor me and my tech reviewer life. But don’t be too jealous. I had to return the glorious gadget to LG after just a month. And now that I’ve returned to my modest life as a mere mortal with a much smaller, cheaper, and less capable HD TV, I’m kind of in withdrawals. Indeed, poor me and my tech reviewer life. A quick note: It’s incredibly difficult to take good photos of a TV screen. The E7’s screen looks better in real life than in any of the photos below. As far as TVs go, LG's E7 looks like an ultra high-end device. The E7's hefty price tag is due largely to the fact that it uses an OLED screen. OLED displays are the best in the business, and LG has been at the forefront of developing OLED TVs. Unfortunately, OLED displays, particularly those large enough for TVs, are still pricey to produce. But that price comes with a big benefit. Unlike traditional liquid crystal display (LCD) screens, OLED screens can produce much truer and deeper black tones. Generally, the closer a screen can come to displaying pure black, the better images look on it. 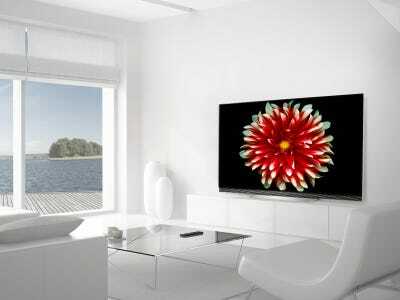 Each pixel in an OLED display is an individual light source. When showing black images, OLED screens just turn off the lights behind them, producing something very close to pure black. 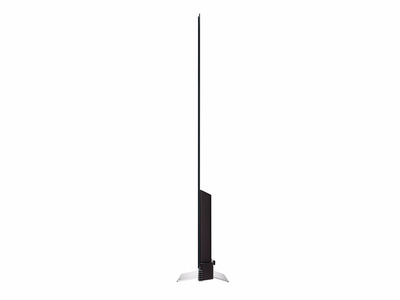 By contrast, the blacks produced by LCD TVs -- commonly and confusingly referred to as LED TVs -- are often closer to grey or charcoal than true black. That's because they create their images differently than OLED screens. In LCD screens, light typically comes from LED bulbs placed along their edge or arrayed across their backs. To produce images, the screens pass that light through colour filters. Generally, LCD's always have at least some of their back lights illuminated, even when trying to display dark scenes or black images. The liquid crystals can't fully block out that light, yielding blacks that are far from true. Like most OLED TVs, the E7 produces near-perfect black tones. 'Planet Earth II' provided a great demonstration of the E7's capabilities. 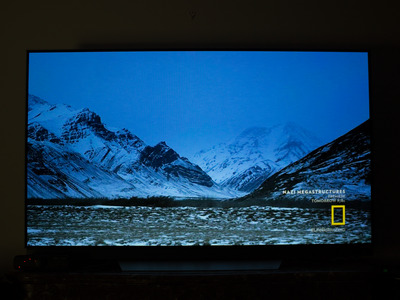 Even though there isn't very much happening on the screen above, this introductory scene from 'Planet Earth II' shows off the capabilities of the E7's OLED display. 'Planet Earth II' is a BBC documentary series that was shot in 4K resolution. When BBC released the series on disc, it tuned the video to support HDR, or high dynamic range, a feature that provides a greater-than-normal range of light and dark tones within images. 'Planet Earth II,' then, provided a perfect test of the E7's ability to display 4K and HDR images. 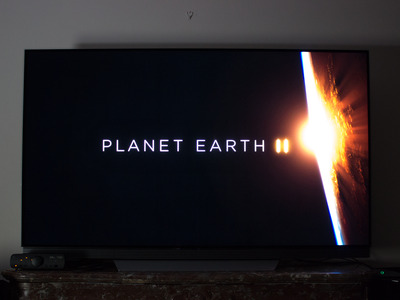 In the scene above, about 90% of the E7's display is turned off, including all of the areas above and below the 'Planet Earth II' logo. That yields a deep, near-perfect black, which allows the illuminated images in the scene to pop out in gorgeous contrast. The E7 displays incredibly rich colours. Again, my photos simply don't do justice to how stunning the picture is on this TV. The colours it displays are vibrant, and the contrast between light and dark areas is just spectacular. The E7 truly offers an enhanced visual experience, and it makes shows such as 'Planet Earth II' look like art. The E7 is so impressive that it make the images displayed by my LCD TV look like they had to pass through a a foggy haze filter. Perhaps it's a trick of the eye caused by the E7's incredible contrast and colour, but its OLED screen somehow look sharpers than those of comparable LCD TVs. The E7 offers great pictures from nearly every angle. No matter whether you're sitting at an angle or directly in front of the E7, the images you'll see will have much the same rich, inky colour and wide range of contrast. So nearly everyone who's watching the TV will have a great view. That gives the E7 a big advantage over many LCD TVs. With those sets, the colours in the images they display typically appear increasingly washed out the farther off you sit from dead center. Videos don't have to support HDR to look great on the E7. HDR basically enhances the contrast between light and dark areas in images. The technology is supported on many of the latest televisions, on movies stored on many Ultra HD Blu-ray discs, and in some of the latest videos streamed through services such as Netflix and Amazon. Compared with non-HDR videos seen on standard LCD televisions, videos that support HDR and are viewed on compatible sets can appear more vibrant. They can also allow you to see details in both very bright and very dim areas that you wouldn't typically see. 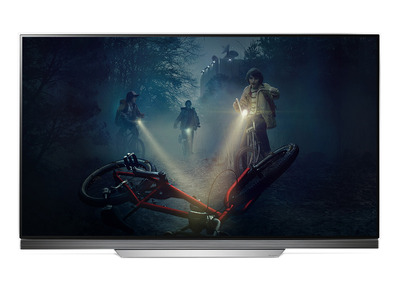 There are several different HDR standards; the E7 supports both HDR 10 and Dolby Vision HDR, which are the two most popular. But you may not notice this capability at all. OLED displays, including the E7's, already enhance videos in a way that's similar to the effect HDR provides -- even on those movies and shows that haven't been tuned for HDR. In other words, OLED TVs already offer such great contrast and colour that they can make non-HDR videos look like they were encoded in HDR. Indeed, I didn't notice much difference when watching HDR videos on the E7 -- everything looked spectacular. The TV comes with a smart remote. You can use the remote like an on-screen pointer or a computer mouse. The E7 uses LG's WebOS operating system and can run Netflix, YouTube, Hulu, and many other apps. It also has a ton of settings that allow you to customise and fine tune the picture. You can launch and interact with the apps or change settings by pointing at the screen with the E7's remote. A pointer will appear on the screen much like what you'd see on a computer when you use a touchpad or mouse. To select an item, you just press the pointer button. 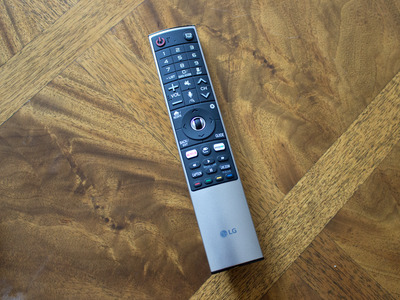 The smart remote makes navigating around settings and WebOS much easier than it would be if you had to use the arrow buttons on a regular remote. The E7 is great for 4K gaming. The grid pattern you see here is an unintended camera effect -- not what you'd actually see on the E7's screen in real life. I plugged a Microsoft Xbox One S into the E7 to see how how well the TV would do when connected to one of the latest game consoles. The Xbox One S can play 4K videos and can play games in a kind of pseudo-4K -- it upscales the resolution of HD games to ultra-high definition resolution. It also can play HDR-encoded games. Overall, games looked great on the E7. 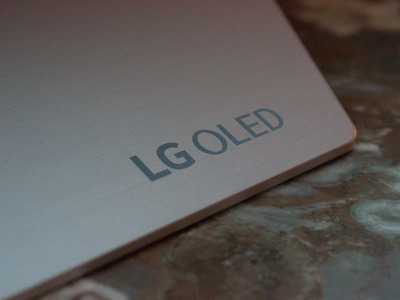 Its high-contrast OLED screen enhances games in the same way it does video. Because of that, non-HDR games look just as good as those encoded with HDR. The E7's built-in speakers sound incredible. I've never heard such good sound come out of a TV before. The E7's speakers deliver clear and crisp sounds with a deep, booming bass. And they produce a convincing surround sound, too. The TV's built-in speakers can easily be used by themselves. In fact, I didn't feel any need to connect the E7 to the surround-sound system I use with my own TV. Still, even on the E7, cable TV still looks like crappy old cable. 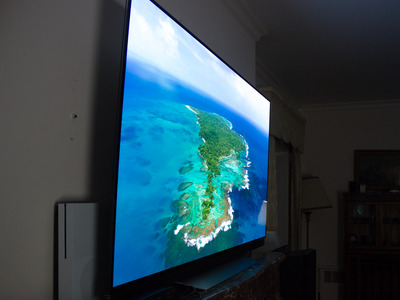 The E7 is fantastic for watching 4K content from streaming services and playing 4K video games. But don't expect your cable TV channels to look phenomenally better than they do on your old television. 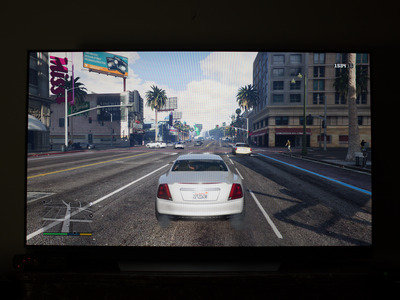 The E7 will upscale lower resolution video like that from cable TV to 4K. But upscaling doesn't generally yield a better picture. Indeed, cable TV looked very similar on the E7 as it did on my older and much cheaper 1080p TV. The E7's OLED display does make cable TV look a little better in terms of contrast and colour than it does on my personal TV's LCD screen. But the difference wasn't enough to justify paying $5,500 for the E7. In other words, if what you primarily do with your television is use it to watch cable, now is not the time to buy a 4K TV. For cable TV enthusiasts, it's better to wait until cable service providers deliver more content in 4K resolution. So, would I buy the E7? Given my own financial situation, I'd end up regretting purchasing the E7, even though LG recently cut its price. To me, its benefits don't justify its cost, especially when you can find plenty of great HDR-compatible 4K LCD TVs for less than $1,300. Yes, the E7 offers unbeatable contrast and can display an amazingly wide range of colours. 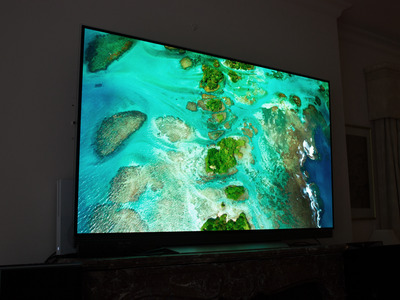 But after I returned it, the only thing I truly missed about it was its jumbo-sized 65-inch screen, which put the 47-inch display on my own TV to shame. Indeed, testing the wallet-killing E7 for a month actually made me more appreciative of my own TV, which cost just $US500. I enjoy TV shows, movies, and games just as much on that LCD set, which supports neither 4K nor HDR, as I did on the E7, with its OLED display and support for both new screen technologies. The E7 isn't LG's only OLED TV. The company offers a bunch of less expensive ones, including some priced around $3,000, that should perform just as well as the E7. That's still pricey, but some may find it easier to justify. Of course, if you have the money to burn, you could really appreciate the E7.